Richard B. Russell Library for Political Research and Studies: Muppets? 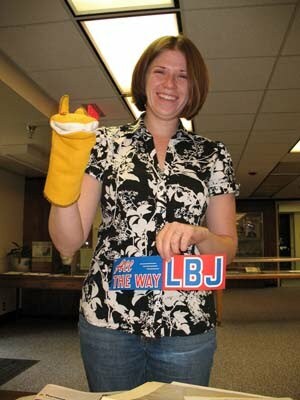 Kat Stein, Head of Arrangement and Description, posed with a new addition to the archives - a hand puppet supporting Lyndon Johnson for President! The homemade puppet looks to be made from a recycled sweatshirt. And while we can't say for sure that its LBJ he's showing support for, the accompanying bumper sticker and other campaign memorabilia make a strong case. Just a fun moment on a regular Tuesday!